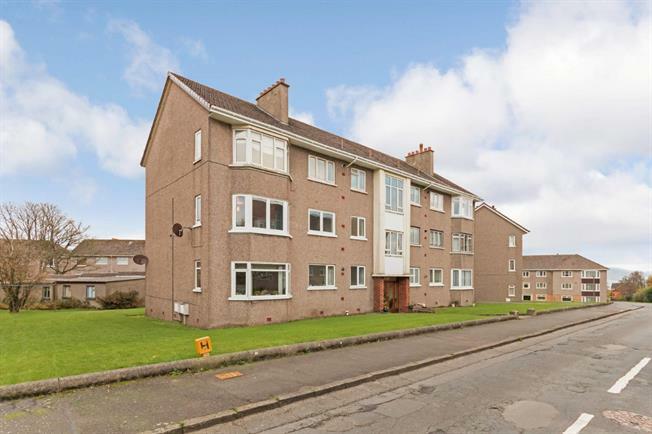 2 Bedroom Flat For Sale in West Kilbride for Offers Over £85,000. Newly renovated and extensively modernised First Floor Apartment within this established location in the popular coastal town of West Kilbride. Viewing is absolutely imperative to appreciate the quality of the finish throughout. The property also benefits from a lock up garage to the rear and partial sea views from most rear facing rooms. Viewing reveals: tidy, communal entrance with stairs leading to the shared first floor level, reception hall with generous storage cupboards, superb lounge /dining room with bay window to the front, newly fitted kitchen with appliances, two double bedrooms and new bathroom suite. Brand new, controllable, electric slim- line wall heaters and new double glazing.. There are also new floor coverings throughout as well as fresh decoration to all walls and ceilings. Communal drying green. View and be impressed! !